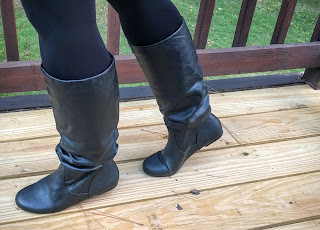 Fall will be here in two days & one of the things I love the most about fall & winter is boots! I love, love shoes (all the shoes!) - I am an accessories girl all the way. So over the next couple of weeks, I am going to do a shoe series - some I've received for reviewing & some I've recently purchased. A little too tight - did I mention I also have wide calves? If you do too, then you know finding great fitting tall boots can be an issue. I don't think slouchy boots are the way to go for me. 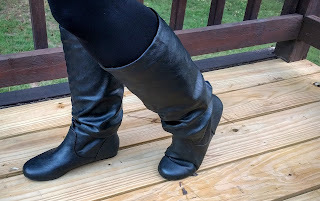 But, if you have long, thin legs & are looking for super affordable, vegan boots - these are your boots! I have no issues wearing leather, but I do think it's great sometimes to go for a vegan option. They also come in a lot of fun colors besides black: tan, charcoal, burgundy, suede colors - it was really hard to pick a color - I wanted to try them all! They are flat which makes them ideal for all day wear; but, if you need some arch support I recommend adding inserts. Also, I think these are only good for fall; they are too thin for winter wear. If you do need to wear them in super cold weather - grab some wool socks to supplement. I was able to purchase these boots with a generous discount in exchange for my honest review. All opinions are 100% my own. Truly its awesome article. Keep it up.